I caught this channel cat by the submerged rock in the background. 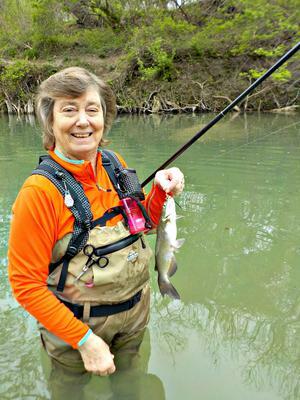 The Field Master has enough backbone for channel catfish. Here's the way I like my catfish hooks tied. My husband, John, writes articles for the TenBum blog, but I thought I’d give him a break and tell you about my favorite fish and rod. 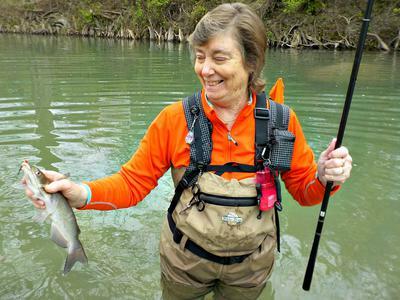 I love to catch catfish, and the rod I use most often is the Suntech Field Master 39. I think it’s a wonderful rod for the skillet-size channel cats I normally catch. Channel catfish have always been my favorites, though it’s hard for me to say why. They have their own kind of beauty and they can be a real challenge on a tenkara or keiryu rod. They are tough fish, and you have to be careful how you handle them because of their sharp fins. When you’re fighting them, they pull straight down or head for rocks and logs. My husband enjoys fishing with flies that he ties, but I prefer to use live butter worms or nightcrawlers. 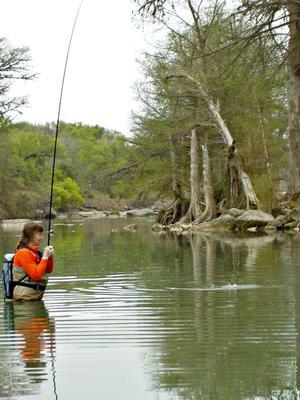 I normally bounce a beadhead hook along the bottom, near large rocks or structure where catfish hang out. I don’t mess with fly tying, but John ties my hooks in the way I prefer. He uses a long-shank nymph hook with a white bead at the head. I have him build a ramp of thread behind the bead to hold it in place. I like the long-shanked hooks because they seem to hold the worms better. See the last picture above for an example. I prefer tenkara or keiryu rods with some backbone. The Suntech Field Master 39 can be fished at different lengths and is stiff enough to get catfish in. It’s a high-quality rod that fits my needs. I’ve caught dozens of catfish with it, and it’s never given me any trouble. Fried catfish is one of our favorite meals, rolled in cornmeal and done to a golden brown. If the channel cats are caught in clean water, they don’t have a strong, fishy flavor at all. If John and I go to the Guadalupe River, and I catch a mess of cats, I feel like I’ve had a good day. Thank you, Robin, for perfectly describing the essence of Keiru: simple, direct, uncomplicated. It is great to hear from a contrarian! I too like catching the less popular fish. My fishing buddies all scoff at me when I get all excited about catching Mountain Whitefish. I have discovered that the lower Boise River has lots of nice catfish, and nobody fishes for them. I like your beadhead setup, and I am going to borrow it, for fishing worms once the runoff has abated on the Boise for catfish. I too enjoy eating them. I've looked at the Fieldmaster as a possible worm rod. It is interesting that Chris talks a lot about soft flexing - full flex rods, and as I read the old masters they continually talk about a "longer - stiffer rod for worms. On my next outing I am going to take my Suntech Genryu Swanobori and try it with worms. I want to check out what the "old masters" saw in this type of setup. They seem to really favor a 14 - 16 foot rod, The Genryu is 14'5". I should be in the ballpark! It is nice hearing from John's "better half." Thank you for the nice remarks. 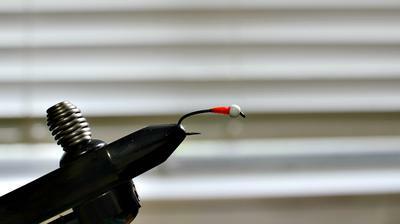 I like the bead to be directly on the hook instead of using splitshot on the line because it casts easier. The catfish don't seem to mind the weight on the hook since they're usually on the bottom anyway.